TheBlueGuerilla: Missing Kipper Found Safe & Well. Havant Kipper Raymond Finch was found safe and well last night after a missing persons appeal was launched, TBG can reveal. Yet instead of promising all things to all men like he did prior to his election on to Hampshire County Council last May, last night he was promising all things to all men to the people of Portsmouth. This in itself has heightened the speculation sparked by TBG some time ago that 'The Finch' is set to replace Douglas Denny as Portsmouth South P.P.C should a by-election take place. 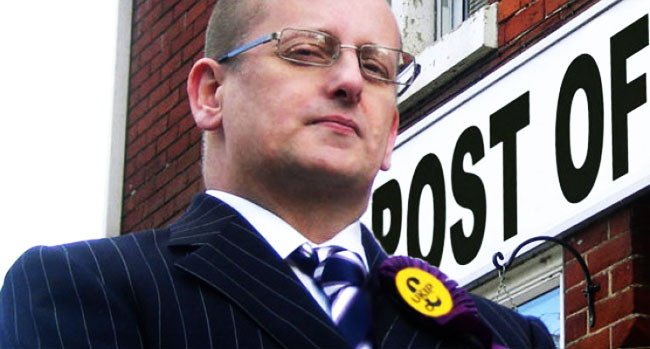 Finch told his Portsmouth audience that the naval city "is full of ordinary, patriotic, hard-working people" and even suggested that it is "the ideal UKIP capital city." "It's about time we stood up for who we are and let people know our identity." TBG thinks anyone who wants to know that should look at his woeful attendance record as Leader of the UKIP Group on Hampshire County Council.